The Sri Lankan consumers’ annual expenditure on cigarettes and tobacco is so high it surpasses the country’s annual bill on milk powder imports. This tobacco expenditure also exceeds another income-the annual export revenue from EU GSP Plus. “Reports say that Sri Lankan consumers spend more than Rs. 200 million per day for cigarettes. According to the World Health Organization in 2015 the direct and indirect cost of tobacco use in Sri Lanka was estimated at Rs. 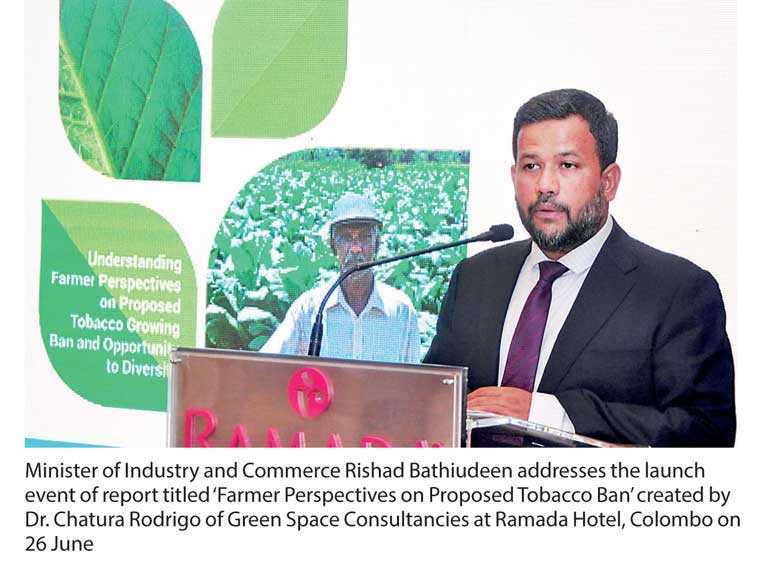 89 billion or $ 662 million,” said Minister of Industry and Commerce Rishad Bathiudeen on 26 June, addressing the launch event of tobacco farmer research report titled ‘Farmer Perspectives on Proposed Tobacco Growing Ban and Opportunity to Diversify’ by Dr. Chatura Rodrigo of Green Space Consultancies (GSC). “In that, we annually spend more than $ 660 million for tobacco use and resulting expenses. When we compare this $ 660 million with some other important values we can understand the huge cost for the economy from tobacco use,” said Bathiudeen. He added: “For example we spend $ 400 million a year to import milk powder to be used by our households and hotels. The $ 660 million we spend for tobacco use is 55% higher than our annual bill for the milk powder imports. The other example is that Sri Lanka’s annual expenditure on tobacco use is even higher than the additional export income from EU GSP plus which is around $ 480 million. In that, our annual tobacco and cigarette expenditure is 37% higher than our annual GSP Plus income alone. Another example is that this annual tobacco cost is equal to total flood and landslide damages incurred by Sri Lanka in both 2015 and 2016. Tobacco expert panel at the event indicated that tobacco is considered as an industrial crop, more than a commercial crop and since the bulk of the harvest is used for nicotine products, it immediately ends up in industrial/machine processing, unlike many other commercial crops. Among all types of full time farmers in Sri Lanka, tobacco farmers are one of the most profitable, earning regular margins of 20% or higher. The ban on tobacco cultivation in Sri Lanka is scheduled to start from 2020. Importation of cigarettes and tobacco also will be banned from 2020.